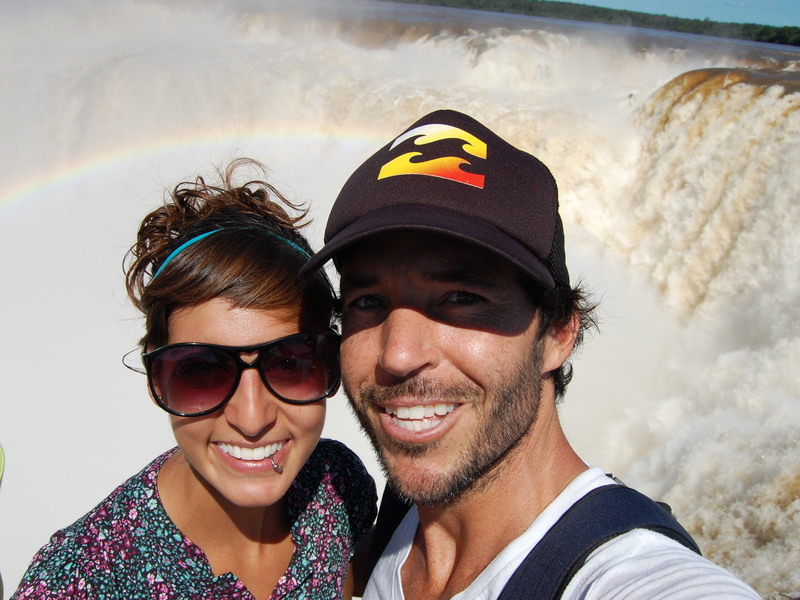 Posted by Jen Pappas in Iguazu Falls. The last thing you want to do after a 17-hour bus ride is trek through the hot streets of a new town only to arrive at the wrong hostel. Factor in 35-pound backpacks, vicious humidity and sleep-deprived delirium and that’s pretty much where we were at. Make no mistake, we went all out for this bus ride, springing for the deluxe full cama seats (almost fully retractable) instead of pinching pennies on the semi-cama like we usually do. Being only 2 of 3 passengers on the first floor of the bus, we had our own little minion slave who served us wine with dinner, kept bringing by a basketful of candy and brought us a tumbler of whiskey before turning out the lights for bed. But still, it was 17 hours. On a bus. In the meantime, two other backpackers showed up so we let them in too. Now there were four of us, but still no proprietor. About forty minutes later, a groggy woman who’d obviously just woken up from siesta appeared from a room behind the kitchen. 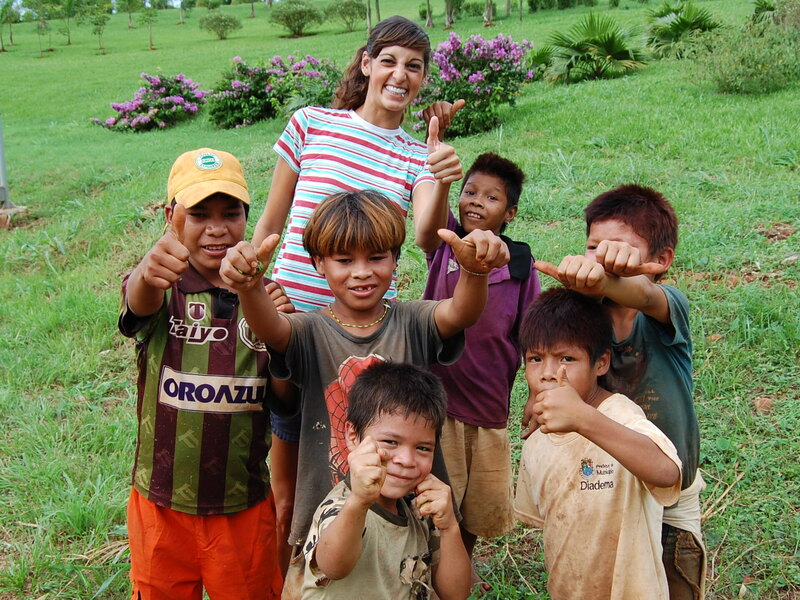 She was almost too shocked by finding four strangers in her hostel to be anything other than apologetic. Thus our introduction to Puerto Iguazú. We spent the rest of the night watching movies from the hostel’s bootleg DVD collection and chatting with Silvia (sleepy owner) in broken Spanish. Our first full day in Puerto Iguazú, we hiked a short way out of town to the grounds of a five star hotel overlooking the river. On our way we came across a group of barefoot boys engaged in some sort of jungle-esque warfare which consisted of throwing mud rocks at one another and ducking for cover behind the hotel’s bushes and shrubs. In Spanish, we asked if we could take their picture and they quickly assembled in the photo below as if they’d been doing it all their short lives. From there, we continued on to Tres Fronteras, or Three Frontiers, the point where the Paraná and Iguazú Rivers meet and you can see Argentina, Brazil and Paraguay all at once. The next morning we caught a bus for Parque Nacional Iguazú, pretty much the highlight of Northern Argentina. We entered the park and followed a small, single path through the jungle, anxious to see what we could already hear roaring up ahead. Under normal circumstances, a single waterfall constitutes an attraction, but Iguazu Falls consists of no less than 275 different falls, the greatest being the mammoth, semicircular Garganta del Diablo, or Devil’s Throat-the tallest fall, measuring in at 262 feet in height. When we emerged from the clearing for our first glimpse of the falls, there was no doubt in our minds why they’re currently on the shortlist for one of the New 7 Wonders of the World. The sheer power, and the incredible amounts of water pouring over the jungle cliffs and rock faces is simply awesome. Standing on one of the many lookout points to watch and listen to the water surging past was a hypnotic experience. You can’t help but wonder where all that water comes from and revel at its force. Meanwhile, exotic butterflies were landing all over us, on our arms, heads and backs, making the experience all the more surreal. Checking off another activity I never thought I’d do in my lifetime, we took a “beneath the falls” boat ride, putting us so close to the falls that it was impossible to open our eyes even to see the towers of water crashing down on us from above. Needless to say, Steve got his adrenaline rush and we were soaked from head to toe. As we’ve mentioned many times before, South America lacks a lot of the red tape we’re used to in the U.S. As a result, a series of catwalks and lookouts were built throughout the park, enabling people to get right over, next to and beneath the blinding towers of water. These catwalks are an impressive feat of engineering by themselves. In order to reach the Devil’s Throat, you board a little train that shuttles you to the entrance of a catwalk that spans the river in a zigzag pattern for about 3/4 of a mile. At the end is what feels like the edge of the world, a gaping hole in the earth where several falls converge and drop into what looks like a bottomless abyss. The catwalk is built over top, right before the thrashing water disappears into nothingness, sending up huge gusts of white spray that soak through your clothes within seconds. A vivid rainbow hung suspended right in the middle of the cavern, where we watched a butterfly get caught up and devoured by the rush of water. During our day at the park, we also came across a band of coaties (rainforest racoons) taking a stroll along a path, a few gigantic lizards with no tails, huge tiger ants and spiders big enough to make your skin crawl. Overall, Iguazú was the perfect ending to our 5 weeks in Argentina. Now, with visas in hand, we’re ready for Brazil. Posted by Jen Pappas in BA. Where does one start with a place like Buenos Aires? Buenos Aires immediately conjures up images of tango, high fashion and European nonchalance without actually having to bother with any real Europeans. Sidewalk cafes and lush foliage line the busy streets. Museums, restaurants, galleries, designer shops and friendly people are all a dime a dozen. Porteños (people from Buenos Aires) are notorious for staying out late, dressing well and enjoying all a good steak has to offer. And though we failed to indulge in any of the country’s world-renowned beef, or deviate from our casual wardrobe, we took every opportunity we could to soak in the city’s vibrant buzz. To hear Steve say, “This is my favorite big city” means a lot and was not without merit. In just over a week we went to the horse races three times, fed animals at the zoo, ran into an Aussie friend we met way back in Chile on the street (small world, even in South America), attended a major concert, toured one of the world’s most affluent cemeteries, watched a 3-D movie in Spanish and got in trouble with the American Embassy. We stayed in the park-filled district of Palermo- a lovely microcosm of dog-walkers, boutique shops, rose gardens and hip bars. If charm and greenery is what you’re after than this is the place. We arrived right in the middle of the city’s first rainy season, so we spent a fair amount of time in Starbucks (only the second one we’ve seen since being in South America) and perusing clothing stores for some new digs. We also spent a fair amount of time dodging piles of dog poop on the sidewalk and trying to fit in as many sights as we could. La Recoleta Cemetery was definitely a highlight. 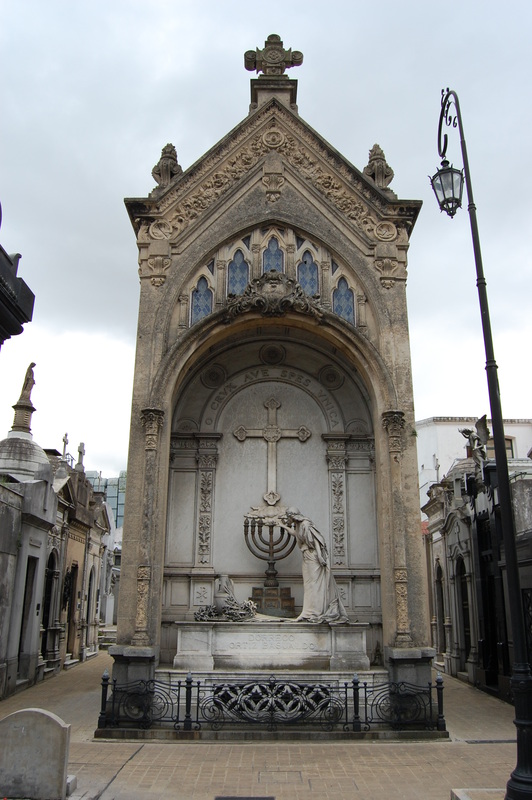 Located in the wealthiest district of B.A., the cemetery is home to some of the most influential and revered Argentines in history. War generals, presidents, scientists and Eva Perón (Madonna’s character in that Evita movie) all share lavish tomb space here. The cemetery is set up like an actual neighborhood, with mausoleums instead of homes lining each creepy street. While we were there, the sky continued to grow darker with clouds until cold, fat raindrops finally began to fall, sending tourists scurrying for the entrance. Another highlight was the Buenos Aires Zoo. I know, I know, you’re probably wondering what the hell? Do they do anything else besides go to the zoo? But let me tell you, this zoo was so worth me writing about it. We went on Thanksgiving day, just to kill time before phoning each of our families to say hello. As soon as we walked in, we noticed what looked like the world’s biggest rodents swimming in the lagoon. They had tails like a rat and faces like a beaver. We soon discovered them to be friendly little creatures called nutria. The zoo sold bags, (or buckets) of food for feeding a list of designated animals, so we bought a bag and Steve fed his very first nutria. Those tiny little nuggets must have been good, because while we were there, we not only got a black bear to stand up on his hind legs for the promise of a treat but we also started an elephant fight and made friends with a paddock full of goats. The Killers Concert was the following night and it rained the whole day. We worried for awhile that the show might actually be cancelled, but around 6 o’clock the sky finally cleared up so we left as scheduled to meet a friend of ours for drinks at a Viking pub near the venue. We arrived only minutes before the first strains of music could be heard, and elbowed our way into the thick of things despite the mud. Argentine fans are not like American fans. Argentine concert-goers are not afraid to jump up and down for the entire set whether they know the songs or not. We gladly joined in, belting out every word of the 18-song set. Right behind the stage was an elevated metro track and each time a train would go by, we could see the conductor slow it down and all the people onboard craning their necks, trying to catch some of the action. We walked home elated: caked in mud, with our ears still buzzing and our throats hoarse from yelling/singing. 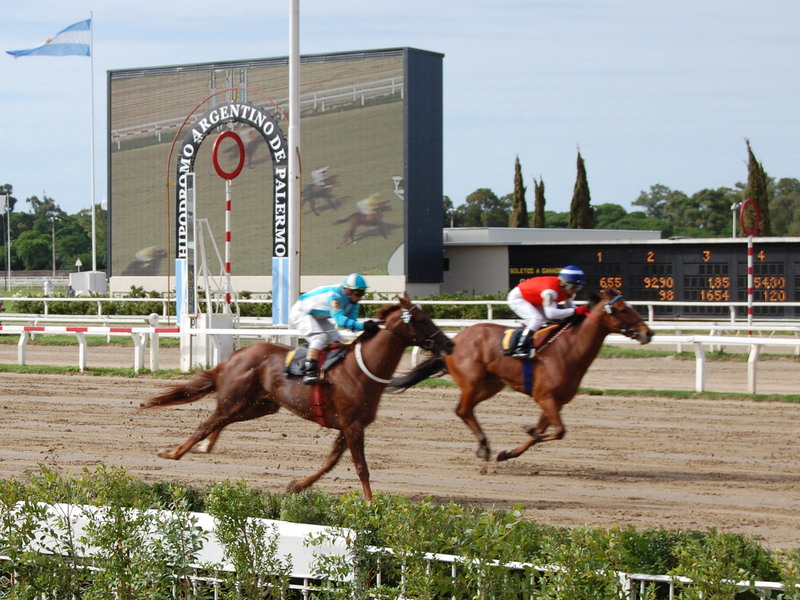 We returned to the track the next day to bet on a few ponies before boarding our 17-hour overnight bus to Puerto Iguazú. Posted by Jen Pappas in Argentina Posts, Buenos Aires. When Steve and I realized that Hippodrome was another word for horse track, we were there. We wandered in on a Friday afternoon without paying any admission fee. 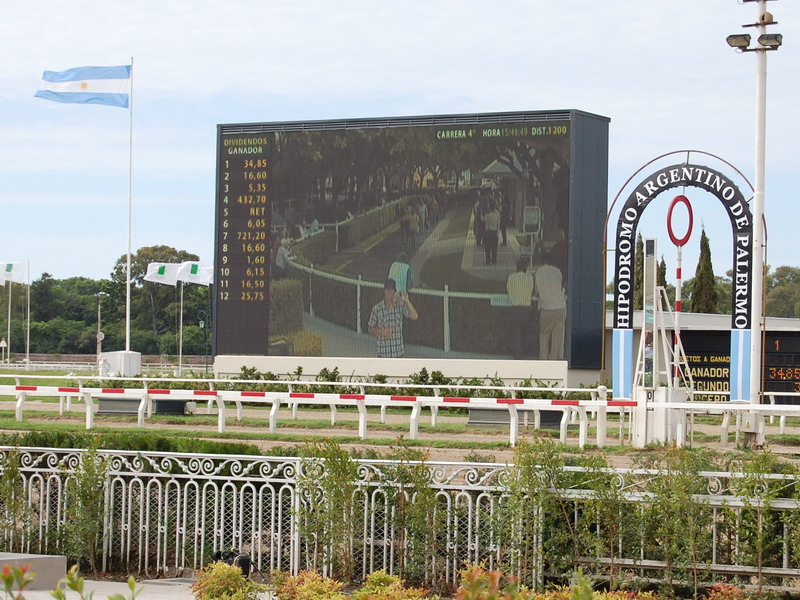 The first race was scheduled to go off at 2:30 p.m. We explored a little bit before the first race, trying to figure out the whole Argentina system of horse tracks. We weren´t allowed entrance into the fancy restaurant and stands because of Steve´s indecent footwear, but we found a racing form and sat down with the normal folks outside to look over the schedule. Two things stood out immediately. One: their method of displaying odds was, uh, odd. We weren´t sure which one was the favorite and which one was the long shot until after the first race. Second: these Argentine horses run far! The distances were listed in meters, with the first race measuring in at 1800 meters, or 8.9 furlongs. The longest race of the day was a whopping 2200 meters, 10.9 furlongs. That´s no joke. We didn´t have any luck betting. We couldn´t even get a horse named Scrabble or Gringo to race in the money. But we did have a good time and will most likely be heading back on Monday to see if we can win a few pesos.